Make your business process easier with purchase order software! Success is driven by great planning as well as results. We understand that businesses need results. We offer broad and optimized set of solutions to solve most common business problems. Our purchase order software helps you to streamline your day to day business activities. Purchase order business software helps to manage sales and purchase order transaction details of your company. 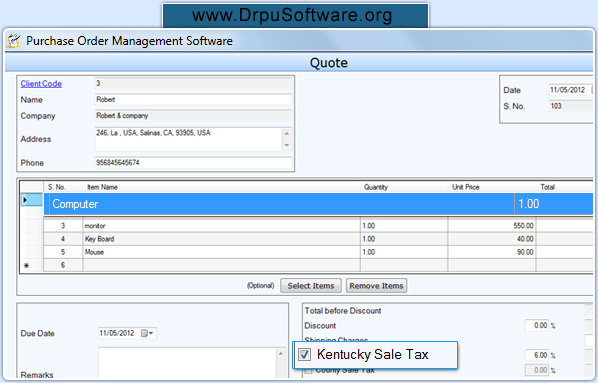 Purchase order software manages purchases, sales, stock/item details in an accurate way. Purchase order software is beneficial for small to large business organization to automate and control entire business process. Manage selling-purchasing records your company in well organized manner. Maintains entire business records including clients/ vendors’ details, item records, sales-purchase records, invoice, receipts, payments and other business information. Provides facility to search sales/purchase records, delivery, payment details and other business records. Provides backup and restore option to recover records if original data lost due to some data loss situations. Password protected feature provides security so that external users cannot access or change the software settings.